Client often ask us for advice on how to deal with a number of different men’s hair issues, and we’re really pleased to be able to now offer new men’s hair products for fine hair launched recently by American Crew. Fortifying Shampoo and Fortifying Scalp Treatment products are designed specifically for guys with fine hair, and are perfect hair products to use during Autumn and Winter months to prevent hair breakage and strengthen scalp. These are men’s hair products from the American Crew range to remove build-up of harmful toxins and dirt in the hair, refresh the scalp and deliver stronger, fuller, thicker hair. During colder, wetter, windier months fine hair can suffer from additional damage, as well as increased breakage – the Fortifying Shampoo and Fortifying Scalp Treatment products help to combat this with daily use. Simply apply as you would with any other men’s shampoo and hair conditioning products, and feel the benefits from these top products in the awesome American Crew range of best-selling men’s hair products. 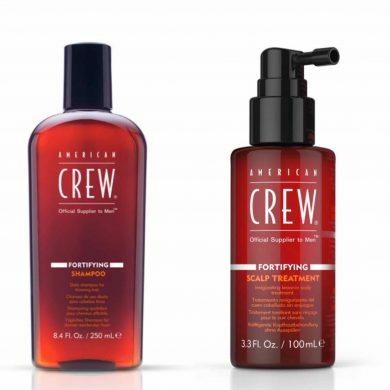 American Crew Fortifying Shampoo is available to buy in-salon for £15, whilst clients can get American Crew Fortifying Scalp Treatment for just £18. To find out more about American Crew, please visit here. To book your own men’s hair consultation to discuss your hair type, the best hair products for you, and the best men’s hairstyle for your hair, simply visit online here. To see more examples of our men’s hair products and male grooming products available at our Bristol men’s hair salon, please visit our barbering blog here. To find out more about our Gloucester Road barber salon in Bristol, contact us here.